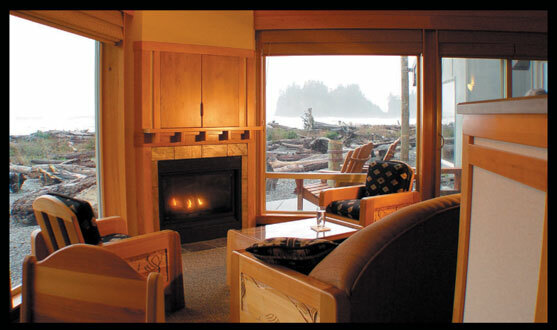 Here where the temperate rainforest meets the wild Pacific, the Ocean Park Resort takes the form of an indigenous village. Bands and sheets of copper, symbols of wealth, adorn the buildings. The power of the landscape is brought into each unit by carefful placement of windows to magnify the views and allow the interior space to gently flow out and merge with the driftwood covered beach. From the cabins one can enjoy raging winter wind and rain storms from the comfort of a hot jetted tub for two or while seated in front of a warm fire.